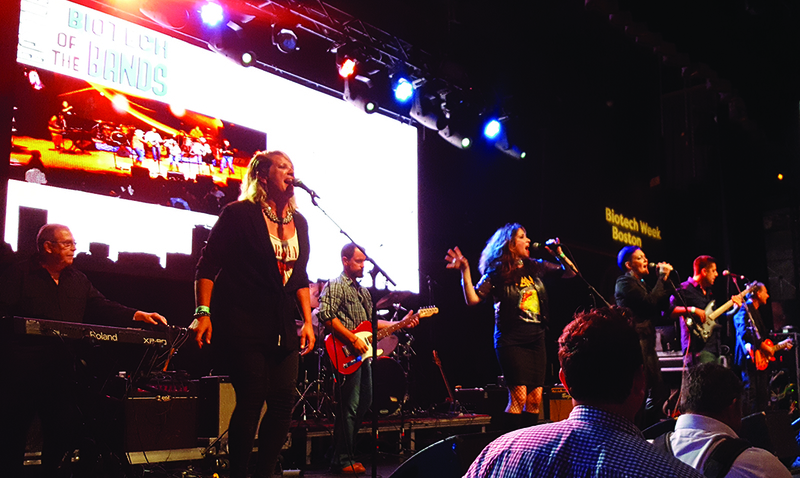 On the night of Wednesday, 27 September 2017, the fourth annual Battle of the Biotech Bands raised US$110,000 for the bands’ selected charities. More than 800 guests enjoyed refreshments at the Royale Nightclub in Boston and watched Led Zymmelin (pictured right, representing Sanofi Genzyme) walk away with the top prize. They raised money for the National Organization for Rare Disorders (NORD). The crowd was a mix of Biotech Week Boston attendees; arts and entertainment critics; developers, contractors, architects, engineers, furniture dealers, and others who serve the life-science community; media; and charitable foundation representatives. Charities supported by the other contestants included The Jolane Solomon Research Fund at Boston College (Aural Gavage, representing Momenta Pharmaceuticals) and The Michael J. Fox Foundation for Parkinson’s Research (Lifesize, representing GE Healthcare Life Sciences). Representing Blueprint Medicines, Aquinnah Pharmaceuticals, and Harmonic Lab Solutions, the final band (Semi Good Lookin’) also played for NORD. The bands were judged by Charlie Farren (guitarist with Farrenheit and the Joe Perry Project), Carter Alan (100 .7 WZLX DJ), and jazz singer Amanda Carr (executive director of WICN Public Radio in Worcester, MA). The event was sponsored by Aquinnah Pharmaceuticals, Blueprint Medicines, Finesse Solutions, GE Healthcare, New England Lab, Sanofi Genzyme, and Thermo Fisher Scientific, among others. We thank them all — as well as committee chairs Sylvia Beaulieu from The Richmond Group and Carly Bassett from Total Office Interiors — for making it an exciting and enjoyable evening. This event underscores the expanded relationship between BPI magazine and Informa’s life-science event organizers, Knect365. The Battle of the Biotech Bands is only one example of the infusion of energy into our shared programs, and we plan to bring you more content in 2018 derived from our conference presentations. The resulting articles will appear primarily in the form of nearly three dozen eBooks (of end-user perspectives) scheduled for 2018 and within an expanded featured report series. Editors of course, have somewhat finite reserves of energy, so to increase our digital presence but leave us time to prepare issues and reports, we are combining our January and February issues and our November and December issues for 2018. You’ll see that our themes also have been tweaked. For 15 years, we’ve alternated upstream, downstream, and manufacturing/product-development themes — our “three pillars” of the larger bioprocess. In 2018, a few issues will stray from those pillars into targeted themes (continuous processing, outsourcing, and single-use technologies — our former supplement topics). Featured reports will continue to focus on areas of special interest. For more information, please take a look at our updated author guidelines. We welcome your thoughts (and manuscripts!) as we head into the new year.